St Powder Coatings is an international and innovative company that produces a wide range of products and services related to the world of powder coatings, designed taking into account the specific needs of the customers. The company, through its sales network, is present across the European Union to which it exports almost 50% of its turnover. ST Powder Coatings S.p.A. has been a member of the Elite network of the Italian Stock Exchange since 2017. The ST Powder Coatings Group operates in the chemical industry, playing a major role at national and international level. The offered products range from powder coatings in epoxy, epoxy-polyester, polyester, polyurethane and silicone systems, offered through a wide range of products and accessories, to complementary products such as customizable spray paints and colour charts. Established in 2004, the Group has gradually developed and is now present with its own sales network across the European Union, to which it exports about 50% of its turnover, which in 2017 exceeded 30 million EUR. The Group's strategy aims at combining its staff growth, through a strong brand building, and external growth, through targeted M&A operations. 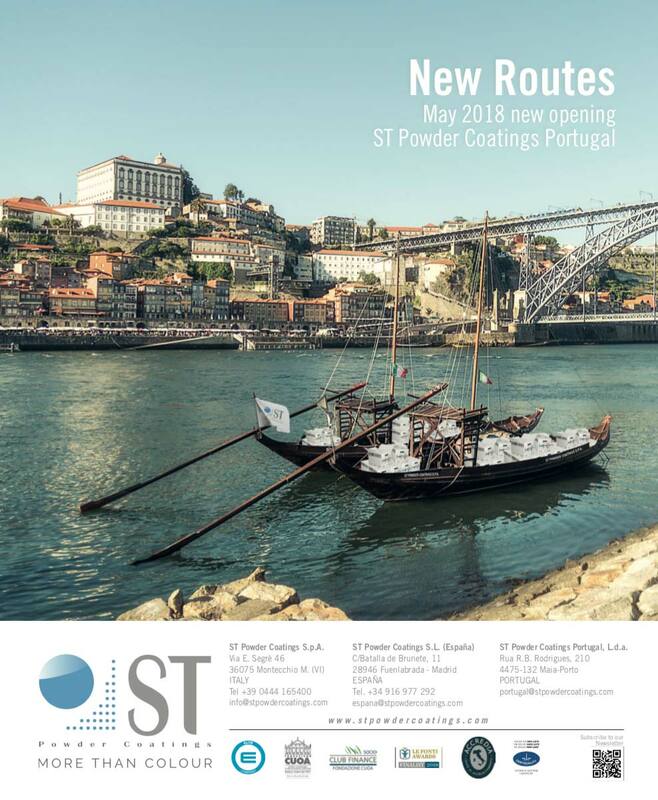 Headquartered in Italy, in Montecchio Maggiore (VI), the ST Powder Coatings Group can boast of two production sites (one in Italy and one in Spain), and a distribution network in 20 countries of the European Union. All the corporate structures are involved on several levels in the Lean Production procedures, an effective system that has created a single working standard to ensure quality at every stage of the production and distribution process of the products, as well as to achieve a single common goal: excellence. The Group currently employs around 150 people. ST produces epoxy, epoxy-polyester, polyester, polyurethane and silicone powder coatings in a wide range of shades and different brightness levels. The product range includes both standard and special items, from the super matt to glossy going through the half matt and half glossy, from the smooth finish to fine and embossed texture, damask, hammered and marbled finish. ST has a specialized department for producing special items, metallic and bonded powder coatings. The special items range includes also coatings with chrome and bronze effects, sparkling, micaceous, fluorescent, pearlescent, transparent, coloured transparent, iridescent effects and many others. ST labs can customize the final product in order to satisfy the customer’s needs and to develop new items, suitable to anticipate future needs. Currently there are more than 9,000 developed items, 700 are stock items immediately available even in the minimum quantity of a single box. The color range includes both standard products and special items, from super matte to shiny going from semi-opaque to semi, with a smooth finish to the rough finish, wrinkle, damask, marbled and textured. Our company can now be counted among the small number of companies that can boast of the attainment of all three certifications, namely the UNI EN ISO 9001 related to quality, the UNI EN ISO 14001 relating to environmental protection and the BS OHSAS 18001 relating to the occupational health and safety, and accident prevention management system. 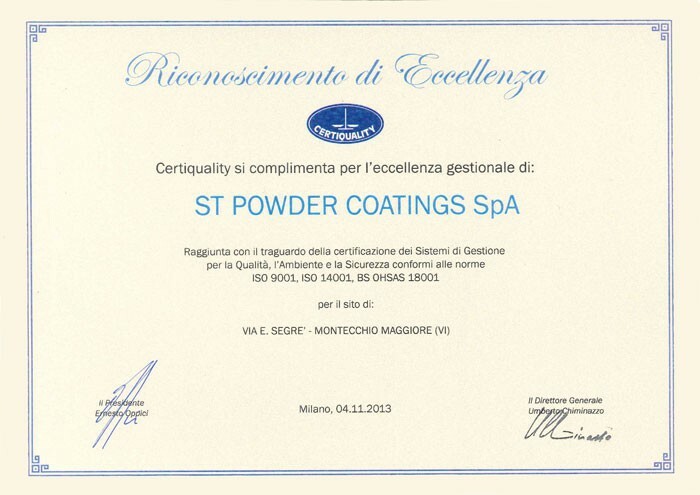 The achievement of this objective provides evidence of an overall organizational model that, by meeting all the standards chosen as a reference, guarantees the total quality of powder coatings, the strict respect for the environment, maximum protection of the health and safety of our employees, as well as an efficient accident prevention system. The prestigious award attained strengthens us in the resoluteness to commit ourselves to continuous improvement through which we aim at increasing the value and improving the image of our company.